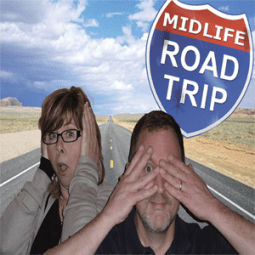 As co-hosts of a series called Midlife Road Trip, road trips are what Sandi and I do best. Though we rarely agree on how to experience a destination, we do agree that our favorite road trip to date was the journey we took along the Pacific Coast Highway in California. Turn on our road trip playlist and hit the road with us. Our journey began in Dana Point, where we went on an incredible whale-watching expedition. We saw several blue whales, which are the largest mammals on earth. We learned that their tongues are the size of an African elephant! While Sandi was impressed with the incredible views from The Ritz Carlton, Laguna Niguel, I was intrigued by the dozens of surfers on the beach below. They made it look so easy. So I checked “learning to surf” off my bucket list. Our next stop up the coast was Huntington Beach, a.k.a. Surf City U.S.A. Later, in Long Beach, Sandi overcame her fear of flying by taking flying lessons! Touring Los Angeles by air was an incredible experience. was our base for the Los Angeles segment of our trip. While here, we did some of the typical touristy things: bought a map of movie star homes and drove around Beverly Hills, cruised the Sunset Strip in Hollywood, ate at Pink’s hot-dog stand, visited the famous Hollywood sign, and scoped out where we’d like them to place our stars on the Hollywood Walk of Fame once we win our Oscars. We ran out of time before we could take any studio tours, so we have another reason to return. Viewfinder Tip: Designate someone to look toward the ocean as you drive up the coast; you might spot a whale! Continuing north, we made brief stops in Malibu and Santa Barbara before taking a detour to Buellton for a bowl of split pea soup at Pea Soup Andersen’s. I’m not particularly a fan of pea soup, so I’m not sure how it would rate on your soup-o-meter scale, but the restaurant itself is cheesy enough to warrant the detour. It was raining when we hit Big Sur, which prompted the closure of a 30-mile section of Highway 1 due to mudslides. Two of the stops on our detour: Hearst Castle, and a beach where a bunch of elephant seals had hauled out for the day. After spending the night in the cute little wine town of Paso Robles, we continued on US 101 to Carmel. Here, we took yet another detour on the super scenic 17-Mile Drive, which meanders through the Monterey Peninsula and right past the famous Pebble Beach golf course. San Francisco was certainly a highlight of the trip as we got to drive down Lombard Street (the “crookedest street in the world”), walk across the Golden Gate Bridge, visit Alcatraz (as tourist, not inmates), and eat fresh sourdough bread. We visited Muir Woods National Monument and concluded our trip in Healdsburg, the heart of Sonoma County Wine Country. There, sipping wine and eating farm-fresh food was the perfect ending to a perfect trip.